The word "Hebrew", and its use in designating the ancient Hebrews associated with the Israelites of the Old Testament, is a term somewhat shrouded in mystery. When the Amarna Letters were discovered, the term Habiru surfaced frequently for the first time. Bible scholars and historians were quick to determine a connection between the two, primarily based on the obvious linguistic similarity. However, this initial connection is now argued by some to have been premature. The Habiru have widely been accepted by scholars as representing a social element only. This is one distinct difference between the Habiru and the ancient Hebrews. Habiru held no ethnic importance, according to some scholars. It was used to designate a new social element of displaced people banding together and forming new tribes. These people had been displaced for a number of reasons (war, famine, debt, etc.) from their homes and native lands. They were forced into exile, and would form up with other outcast individuals of similar fates for survival. These bands may include runaway slaves, overthrown kings, exiled individuals, bandits and outlaws, deserters, or migrants. The common thread was their diversity in backgrounds, ethnicity, culture and home. They were united in exile. 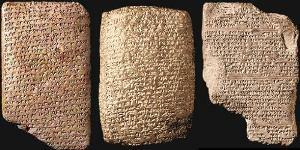 The Amarna Letter original tablets. Habiru are found integrating themselves into their new societies at every level of society. They ranged from domestic work, to government work, manual labor, artisans, metal workers, musicians, indentured servitude, mercenaries, farmers, etc. They were found in every society of the Ancient Near East from Egypt to Mesopotamia. The term Habiru, and related terms, were first identified around 3000 B.C. The word is no longer in use by 1000 BC. The ancient Hebrews connection to the Habiru is less easier to define than may appear. What becomes clear in the Old Testament is that there are two appellations used to denote the Israelites; one being "Israelite", and the second being "Hebrew". A clear understanding of the context of the word "Hebrew" and its use in ancient Hebrew culture is necessary in order to understand the difference between the two names. The first appearance of the word "Hebrew" appears in Genesis 14:13 in association with Abraham. "Then a fugitive came and told Abram the Hebrew. Now he was living by the oaks of Mamre the Amorite, brother of Eshcol and brother of Aner, and these were allies with Abram." Interestingly enough, a fugitive is mentioned in this particular passage as coming to Abram - whether intentionally or by accident we are not told. Fugitives were also an element found within the Habiru. The interpretation of the Hebrew word, "Hebrew", has been brought into question as well. The association of Abraham with a fugitive, and the questionable interpretation of the word "Hebrew", pose interesting questions when one considers the origin and precise meaning of the word. Why else would the Bible use two different names for God's people in the Old Testament - Israel & Hebrew? There must be a reason for the use of each. Though "fugitive" in this passage may indicate a broad spectrum of meanings, it is generally agreed upon the word in antiquity implied someone separated from his tribe and home. 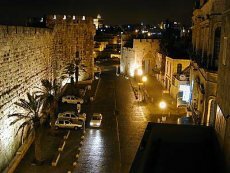 Scripture seems to imply he immediately sought out Abraham, living south of Jerusalem near Hebron at the time. This fact would be aligned with the fact Habiru are known to have existed throughout the Ancient Near East, and into the later parts of the third millennium and stretching through the Bronze Age. Thus it is quite likely some Habiru existed in southern Canaan, and likely interacted with Abraham's household. Nor is it a stretch to presume Abraham may have been viewed as a Habiru chief to those he interacted with. He was the head of a large household, which eventually split into two. He did migrate from another land - being Ur of southern Mesopotamia. He did have soldiers in his household, and was a skilled fighter and leader himself. However, the use of the word "Ibriy", translated as 'Hebrew' in English, in connection with Abraham clearly distinguishes him from the Habiru - also referred to as Apiru, Hapiru, Abiru in other various texts. The linguistic similarities between "Habiru" and "Hebrew" are enough to lead one to think they were connected at some point in history. The Hebrews were likely viewed as Habiru-like in nature - especially under Moses when they were wandering in the desert for forty years. In this context, the Hebrews were a band of Habiru - refugees in exile. In the Strong's Dictionary of Biblical Hebrew and Chaldee, IBRIY derives from a family name. It is a surname from the Hebrew word Eber, and designates an Eberite. The Hebrew word Eber translates as "a region beyond". Eber is also the name of a descendant of Shem, and ancestor of Abraham. Genesis 10:21 mentions Eber. "Unto Shem, also the father of all the children of Eber, the brother of Japheth the elder, even to him were children born." Interestingly enough, the word Eber finds its origins in the Hebrew word translated as "Abar". Spiros Zodhiates is a linguistic master, and his work on the Hebrew and Greek languages is very thorough. He states Abar is a primitive Hebrew root found over 550 times in the Old Testament. Two different meanings are taken from the root Abar. One meaning is to pass over, through, by, pass on. The second meaning is to violate a law, to be arrogant, become angry, to transgress. Either meaning could be used to describe an Habiru individual or tribe. The same may be said for Israel as they marched through the desert, or, slaughtered their way into Canaan, or violated the Law of Moses. Many of the languages in Canaan are thought to have originated from one or more unknown language(s) of Semitic origin. In other words, not a lot is known about the origin of language at its earliest stage. Hebrew, along with other Canaanite languages, are extremely old languages. The tribes of Canaan, and the Near East, spoke mainly Semitic languages. The Sumerians are a notable exception. The ancient Hebrews were a West Semitic tribe in the days of Abraham. Abraham, however, was the only one of the ancient Hebrews to live permanently in Canaan. His father, Terah, and much of his other kinfolk dwelt in Haran, Mesopotamia and the surrounding villages and cities. Abraham was the only Hebrew we know of living in Canaan, hence the designation in Genesis 14:13 as "Abraham the Hebrew". There are some scholars who have suggested the word 'Habiru' stems from the same West Semitic root as Ibriy. The ancient Hebrews, however, were not the only West Semitic people living in northern Mesopotamia, Syria and Canaan. The Phoenicians and Amorites are just a couple of the nations claiming West Semitic descent. The Arameans centered in Damascus, Syria were close relatives of Abraham and Jacob. The Edomites would become the West Semitic descendants of Esau. The ancient Hebrews would not become known as Israelites until God renamed Jacob "Israel". The earliest reference to Habiru is found in ancient Sumerian sources. The term appeared in a historical context when large numbers of native Akkadian speaking people appeared in ancient Sumeria. These Akkadians became a new element in Sumerian society, and the terms Habiru and Habiri began appearing in various texts. The word Habiru stems from an Akkadian root scholars have been unable to identify with certainty. The origin of languages, as stated above, remains one of the most bothersome mysteries to historians and scholars. The ancient Hebrew alphabet is the oldest language still in use today. Hebrew is a Semitic language, very different from the Indo-European based languages of Western Civilization today. Courtesy of Amazon.com, Hebrew World Distribution offers this revolutionary product in the study of Hebrew. The Hebrew / English Transliterated Bible Cd-rom is the most cost effective and efficient way to learn Hebrew. No previous knowledge of Hebrew is required. Concise Transliteration, broken down syllable by syllable, leads you to a 90% proficiency level. A free MP3 cd, with the entire Bible in Hebrew, comes with the package. 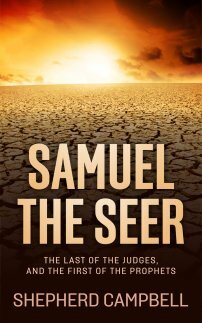 Over 4000 pages, containing the entire Tanach (The Old Testament, Prophets, Psalms and more) also is included. Click on the link below to visit Amazon.com and learn Hebrew today! 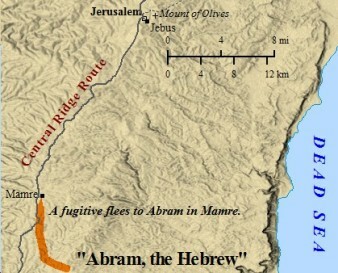 The Hebrews, especially Abraham, crossed over from a migratory sense. Abraham and his family crossed over into the land of Canaan from Mesopotamia. They literally had to cross over the desert to achieve this, by way of Haran and Aram - Naharaim. In this sense, Abraham the Hebrew, may have also been called, Abraham the Habiru. An Ancient Depiction of a Habiru. Along these same lines, the ancient Hebrews could have been viewed as part of the Habiru. It seems logical the ruling authorities would have cared less about the Hebrew lineage, and presumably would have grouped them in with the other "outcast" and "troublesome" elements found among the Habiru of the Amarna Letters. The ancient Hebrews, however, took careful pains to clarify their ethnicity as being pure. Hebrew was an ethnic term. Habiru, as stated earlier, was purely a social term.The authorities would have cared less. Thus, though the two may stem from the same West Semitic root, one was distinctly different from the other. In later Old Testament stories the designation 'Hebrew' became a derogatory term. In the time of Abraham this was not the case. Something set Abraham apart as "Ibriy", as opposed to, "Habiru". Ibriy is Abraham's family name, thus consistent with Hebrew as an ethnic term. This lineage is seen in the lines of Shem and Eber. Scripture lists five sons of Shem. One of these sons is Arphaxad. Arphaxad is said to have had a son named Salah. Salah, in turn, gives birth to a son named Eber. Eber was one of the earliest post-flood members of this divine family. He was the great-grandson of Shem. Eber was the last man of the Bible to live an exceptionally long, though still reduced, life. He lived to be 464 years old. Pelug, Eber's son, died at 239. Ages continued to significantly reduce from that point. From the line of Eber emerges the ancient Hebrews, and eventually Abraham. By the time Abraham is referred to as the "Hebrew"(or Habiru ?) in Genesis, he is the sixth generation removed from Eber. Eber (from root Abar) is recognized by many Bible scholars as the father of the ancient Hebrews (from root Eber) through the lineage described in the earlier chapters of Genesis. The distinguishable characteristic of the of Eber, which from Shem can be traced to Adam, and extends forward to Abraham, was their worship of God Almighty - YHWH, or Elohim. Scripture makes it clear, however, that Abraham's forefathers worshiped other gods, and God Almighty may have just been one of their many gods. The line of Eber perhaps held fast to the true God more so than other family tribes. Scripture indicates ancient Hebrews such as Terah previously had practiced idolatry from time to time, or perhaps were consistent idolaters. Abraham, thus, fully established God Almighty as the Hebrew God by answering His call faithfully, and by living a life dedicated to the worship of one God. Abraham tore from the grip of idolatry and believed in the One True God. In this context, it makes sense when Paul says in Galatians 3:6 Abraham believed, and for his belief God credited him with righteousness. Abraham had every reason NOT to believe - and yet he did. Abraham's belief in a unique God may be yet another parallel between Hebrews and Habirus. Further connections between the two were found in ancient Hittite documents attributing special divine powers to certain Habiru groups. These Habiru groups were given special mention because of their god and their divine presence. The Habiru god had other worldly powers, according to the Hittite texts. The ancient Hebrews indeed possessed a special Hebrew God, and a special Hebrew name for their One True God. In summary, the ancient Hebrews shared many similar traits to the Habiru. The unknown origin of the Akkadian root of Habiru indicates the two words may have been related to the same West Semitic language. The two certainly shared similar linguistic traits. Abraham may have been considered by native locals as a Habiru. However, Hebrew was a distinctly different appellation used to designate a select ethnic group. Habiru designated a social element of society, of which the Hebrews were most likely a part of. SHARE YOUR THOUGHTS ON THE ANCIENT HEBREWS. Do you study the Old Testament? What do you think of the difference between a Hebrew, and an Israelite? Click on the above link to give us your insights, thoughts, comments, and questions!